Sometimes, social media leads to great opportunities. 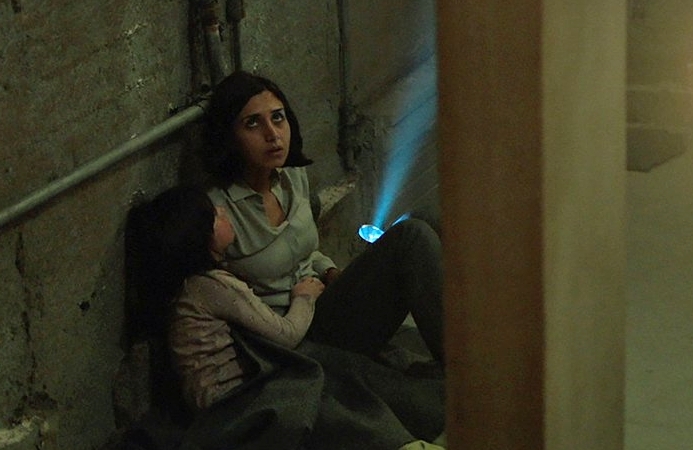 After I was quite taken aback with the Iranian film “Under the Shadow” last May at the Chicago Critics Film Festival, I tweeted about how much I liked it, including the tremendous lead actress from the film, Narges Rashidi, in my tweet. Much to my surprise, that tweet led to her reaching out to me and after a little messaging back and forth she agreed to an interview about her involvement in writer/director Babak Anvari’s atmospheric feature-length debut. It’s being touted as a horror film, but I see it as more of a fascinating psychological thriller, immersing viewers in the Iran-Iraq war of the late 80s while hinting at some potent social commentary at the same time. Rashidi plays Shideh, a struggling mother trying to make sense of a mysterious evil that is haunting her and her young daughter, Dorsa in their apartment complex, where the threat of bombing looms. As the child becomes ill, nightmares fueled by anxiety and insecurity increase for Shideh. She still has a strong desire to become a doctor, like her husband, as her mother had wanted, but due to her political activism in her college years, she has been denied the opportunity to further her studies. This only fuels her frustration and anxiety. As these potent emotions increase in Shideh, so does the presence of djinn, mythic haunting demons that prey off anxiety and fear. As he builds a palpable sense of frenzy, director Anvari also acutely portrays how cruelly women tend to be treating in Iran. If it wasn’t for the expressive and vulnerable work from Rashidi though, the legitimate scares and supernatural element present in the film wouldn’t have been very convincing. Rashidi was born in Iran and went on to study acting in Germany. She has primarily appeared in shorts and German TV series, but she also had minor roles in international features, 2005’s “Aeon Flux” and 2008’s “Speed Racer”. Last year, she starred in the German drama “Von Glücklichen Schafen” and has appeared in the German crime TV series “Die Spezialisten – Im Namen der Opfer” this year. But “Under the Shadow” is the role that will likely be introducing her fascinating on-screen presence to a wider audience. I certainly look forward to more work from both Rashidi and Anvari. I’ve also been looking forward to sharing this interview that took place via Skype (which took some maneuvering on my end) on Memorial Day of this year. With the film, which was picked up by Netflix this past January at Sundance, receiving a limited theatrical release here in the states on October 7th, now is a good time to share this casual and fun interview…. NARGES RASHIDI: Hullo? Can you hear me? DAVID J. FOWLIE: Hullo! Yes, I just can’t see you. Are you on video or audio? DF: Yeah, that’s fine with me. NR: I didn’t put on any make-up. So, if you want to see my crappy face. I can…. NR: Okay! How are you? DF: I’m doing good. So, I recently saw “Under the Shadow” here in Chicago at the Chicago Critics Film Festival. Were you aware that the film was being shown there? NR: No, I didn’t. I had no idea. NR: Yeah. I had no idea. I knew it was in San Francisco, but I didn’t know it was in Chicago at all. DF: Yeah. There are a couple different board members from the Chicago Film Critics Association that go to different film festivals – from Toronto to SXSW – and select the best they’ve seen, with the goal of bringing them back to show to an audience in Chicago. The festival runs for about a week in a local movie house here and the goal is to just bring the best of the fests back home. DF: It really is. I’ve seen so many great movies that way and some of them wind up being the best of the year. DF: So, “Under the Shadow” was my favorite of the movie I saw at the festival…. DF: We’re welcome. So, I thought it was very surprising the way you reached out to me on Twitter and responded to my tweet about the film (both laugh)…because I would never have thought that the best falafel would be in Germany (laughs). NR: (laughs) That’s what I figured. I really love falafel myself and I just saw your tweet and it just showed up on my Twitter and I thought “who is this guy?” and then I looked it up and I liked, you know, that you are looking for the best falafel, because I love falafel. I’ve tried so many and I gotta tell you, the best ones are in Berlin. DF: I would have never thought that. You went to school there, right? NR: I did, yeah. I grew up in Germany and I lived in Berlin for twelve years before moving to the States. DF: Okay. And then you migrated to L.A. for acting? NR: Yeah. Yeah, well I just like L.A. It’s not – I don’t know. Probably (laughs). It’s so funny, because I go back and forth all the time to Germany for acting…. NR: Yes. Yes. So, it’s not really – I didn’t really plan it. It was just, you know – my husband loves L.A., he works here. He used to be a tennis professional and he is a tennis coach now. So, because of the weather and people being so enthusiastic about sports, it was an option. Because we can’t really move to – it would be hard for me to move to, I don’t know, Spain, I don’t speak with language. It would be hard. So, L.A. was a city which we both liked and a place we’d both be able to work. Atlanta is too cold. DF: Have you ever been to Chicago? NR: Never. No. I’d love to. DF: Well, come in the fall or the spring. DF: The weather is best then. You don’t want to come in the winter, because the cold is just terrible. NR: Is it similar to New York? DF: Ah, it’s a bit more severe, actually, because you have Lake Michigan bringing in a lot of wind. It just gets really bitter cold. The kind of cold where you feel like your face is gonna get torn off. NR: Okay. Well, I can’t do that. I fled that cold coming from L.A. to Berlin. DF: Right. It gets that cold. NR: Yeah, I can’t do that. DF: So, do you ever get to the Berlin International Film Festival? NR: Yeah yeah yeah – If you live in Berlin, you go there. NR: Sure. I’ve never had a movie there. So, start a petition. DF: I’m thinking you will. DF: So, of course, as one does in preparation for an interview, I did a little IMDb research (both laugh) and, obviously since you’ve spent so much time in Germany, you started most of your acting there, right? DF: There was “Aeon Flux” and then some TV work. Can you talk about how all that started for you – did you have an agent before you went on auditions or did you just start going out on auditions? How did that all work? NR: Well, I studied acting there and went to acting school and during that period, my agent came and watched some of my plays. And she liked me, so we met up and we got together – and that was my first agent. She sent me out for projects. There were a lot of….crappy independent films (laughs) – like, a lot of (laughs) – I can’t say it. I just wanted to act in the beginning. I was lucky though, because one of my first real, or paid, jobs, was “Aeon Flux”. So, that was great. That was an amazing experience. DF: And that was an interesting movie, because it was a female director, right? DF: …with Charlize Theron in the lead. And it was a movie that was a little before it’s time, considering it is essentially a comic book movie, even though it’s based on an MTV animated series. So, what was the vibe like on that if you can remember? NR: I think everybody was very excited to do it. You know? It was very exciting and I it was also very special, because there was a female director involved, because it’s been a long time ago. It’s been like eleven years. NR: Oh, okay. So, we shot it in 2004. It’s been a while. Yeah, I think having Karyn Kusama direct it was special. It never occurred to me that it was ever a problem having female leads back in the day, because I was so young. DF: Regardless, it was obviously something unique to you. NR: Oh yes. It was very very unique. It was special. I like the movie. It’s cute – it’s not cute. Cute is lately my favorite word (both laugh), I don’t know why. It was my first movie set that big – there were like 300 people on the set – and then being in a movie with Charlize Theron was very very special. DF: It obviously holds a special place for you. 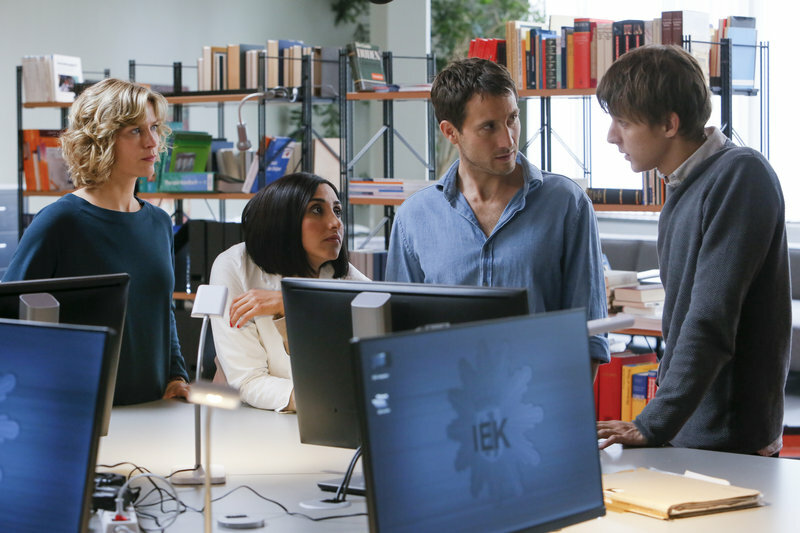 DF: Then you were a part of a lot of German TV shows. Are you currently still part of one right now, the role of Samira in “Die Spezialisten – Im Namen der Opfer”…. NR: Samira. Yeah. I have to go and do a second season. I don’t know exactly how much I can be involved in the second season, because of other jobs. But yeah, I’m definitely going to go back and shoot the second season, I just don’t know how much I’m going to be in it. DF: Gotcha. Before we get to “Under the Shadow”, I wanted to bring up one particular movie you were in from your past work and that’s “Speed Racer”, a movie I absolutely love and wind up defending all the time. Can you talk about your involvement in that movie? NR: Well, I don’t know. My part in “Speed Racer” is soooooo small (laughs). DF: It’s basically in a montage, isn’t it? NR: Yeah yeah yeah. It’s so small. I remember I had to learn a whole page of monologue – it’s a monologue that everybody had, but they’d just take pieces and spread it out. I played an Iranian reporter who’s talking about the race. Working with the Wachowski siblings was really special. NR: It was at least great to be in that movie though (laughs). DF: You know how IMDb goes, everything is there – from “Pregnant Woman” to “Persian Announcer” and now this role – and, to be honest, I find it fascinating to the variety of roles an actor will have in his/her career. NR: That’s true. That’s a fun part of the job, because you get to be these different people in these different situations of life. That’s why we do the job. That’s the fun part of it. DF: So, I’ll tell you what drew me to “Under the Shadow”. It was on the schedule for the festival, but I’ve already been kind of an Iranian film kick lately. NR: Okay! There are great movies coming out of Iran. This is not even an Iranian movie, because it’s a British production. Right, but lately there are so many good movies coming out of Iran. DF: Right. There’s this great theater downtown, the Gene Siskel Film Center and they had a fantastic Iranian Film Festival that spanned an entire month, earlier this year. I saw “The Sale”, “Melbourne”, “Avalanche” and “Time to Love” – have you seen any of those? DF: Seeing those movies and “Under the Shadow” reminded me of one of the elements that attracts me to film, which is the potential to be transported and see the world from another point of view, in ways that I probably never would’ve been able to understand. That’s what “Under the Shadow” did for me. There’s obviously going to be a draw when people read Iranian “horror” movie, because you’re gonna get horror fans coming to see the movie, but I think audiences are going to get a lot more out of it than they may expect. What did you notice about it the first time you read the script? NR: I loved the script from the first time I read it, I’ve got to tell you. Honestly, when I read the script, I was blown away by it. First of all, it’s truly political and it starts off with these genre mixes – where you don’t really know where it will go, but the first twenty or thirty minutes is a social drama. It doesn’t have anything to do with a horror movie. It turns into a thriller and has these horror elements and I thought it was very very very smartly thought. To put this whole anxiety of this person to this political background and tell the story of the Iran-Iraq war in the 80s. I think it’s a story that’s not been told many times. So, I thought that was very interesting. And plus, I was born in Iran. So, I kind of remember – my early years were in Iran – so, that was during the Iran-Iraq war. There are a lot of memories. So, I felt very connected to it. I talked to the director and I saw his first short film and I thought that was so brilliant and I thought, yeah, I’d love to work with him. DF: He has a very assured sense of placement and lighting in his directing, but was there also an assurance, a confidence if you will, apparent in the script when you first read it? NR: Oh, for sure. For sure. It was so smart. And it has so many little details that when you read it and you read it again, you keep finding these little nuances that you don’t necessarily see in the first place. So, when you go into it – even if you watch the movie again – you’d find little new things, which is, I think, so smart. DF: Oh, I’m sure because as soon as the movie ended, I wanted to watch to just ask the projectionist to reply it (both laugh). I just felt I had to take it all in again since there’s always stuff to pick up on again. NR: Yeah, that was very very very cool. I never really questioned it. I don’t know. I’m a very stomach-driven person, like I always go with my gut. Sometimes I’m wrong (both laugh), but usually I feel like my gut feeling has been good to me. No, this was such a gift, this script. DF: How did this script come to you? How did Babak get a hold of you? NR: A very good friend of mine, Navid Negahban, he played Abur Nazir in “Homeland”, and he had heard about this script and they were talking about it – he was never in the movie because he couldn’t make it work time-wise. But he knew that they were looking for someone and he recommended me. And then they sent me the script and talked to the producers and I connected very well with them and I Skyped with Babak and we connected as well. I went to London and we met again and that was it. DF: You shot the film how many years ago? NR: Oh, we shot last year. NR: Yeah yeah yeah. We shot from April to May, so it’s been exactly a year ago. DF: Wow. That was a quick turnaround. I know you filmed for 21 days and that was in Jordan, right? DF: And he found an apartment building there? NR: Yes. They found an apartment – we had actually two buildings. One was with the open roof where they could put the missile in and the other was for my apartment and the whole stairway. We shot in two apartments, but most of it was shot in one apartment building in Jordan. It was great. DF: I know you had your conversations with the director, but were you aware that this is a movie that would most likely be marketed as a horror film? NR: I never think in genres or in the marketing of a film. I just read the script and if I like how the story is being told, that’s the most important thing to me. And then I think – Okay, how’s this character? Is it interesting? Can I do it? Do I want to go there? That’s how I choose my movies. I don’t really think in terms of genres. It could be a comedy. I love drama. It could be horror or a thriller – it could be action. It doesn’t really matter. I love movies and I love telling stories. DF: And that’s the most important thing. The reason I ask is because when I’m telling others about the movie, you have to describe the movie in a certain way. Yes, it’s listed as a horror film, but it’s so much more. To me, what carries the movie are the emotions present throughout – like anxiety, paranoia, fear, frustration and insecurity. Can you talk about those emotions as you were finding your character and maybe how your approach changed from when you initially reading the script and then actually filming it? NR: Well, you know, when you read a script, everything is so prepared or theoretical. You do all your research and all your background work. It’s a lot of work and it’s fun. But when I started shooting it, I didn’t think. I was just there and doing – going through each moment that the character was going through. You know? I can’t even remember because it went by so fast and it was a lot of work. I enjoyed every second of shooting this. I can’t tell you. You always learn about yourself and the character. This woman was very smart, very political – she had gone to university. She’s not very – how do you say? – she doesn’t believe in the supernatural. She’s very clear in her way of thinking. But because of the war and what’s happening around her, she’s like losing it more and more. So, the decision I made for this character was that she never really knew if this was happening for real or in her head. Is it real or is it me losing it? DF: And that definitely comes across. NR: I can’t tell you up until now – was there a djinn or wasn’t there a djinn. I can’t tell you. I still can’t tell you. DF: Well, that’s my next question. I had to Google djinn…. DF: I thought it was a really cool concept and added element, especially how it heightened frustration and anxiety. You’re already a frustrated character because of the way you’re scorned and shunned from seeking a career. So, where you aware of these supernatural mythic characters growing up? NR: Oh, when I was a child, I was very scared. I dont’ know if it was ‘djinn’, I didn’t really call it anything. I was just scared of ghosts, really. I would sleep in a very dark room and I would always have to leave the light on. Yeah, things like that. But, I’m not scared anymore. DF: That’s good. But, you were familiar with djinn, growing up though? NR: Yes. Yes, that’s a very common name in Iran. Also, anxiety – if someone lives in a war that goes on for eight years, you live with anxiety all the time and it does things to you that you don’t even realize. It’s just happening to you without you realizing it’s happening. What I remember, when I see all the pictures from back in the day, is that people were so exhausted. When you have to deal with a war on a daily basis, it becomes normal. I remember once, I woke up when there were missiles falling and it was very loud. I woke up from the sound. And I asked my mom, “What was that?” and she said, “Nothing. Just a bomb.” Like it was nothing, you know? That’s how people dealt with it. Things become so normal. Or like my mom, when we down to the basement to be secure, she would always turn on music and we would start dancing and singing so we wouldn’t be scared. But what influenced me most was that feeling of exhaustion, how exhausted people looked and how the war does something to you without you even recognizing it. DF: There’s the trauma of the war and I think, even without djinn, there would still be a very compelling story here. But, that added element heightens everything. So, you have the social commentary, the horror elements, the emotional and the supernatural. The way it all comes together is impressive. Can you talk about how much character background you and Babak created and discussed about your character? NR: A lot. A lot. He would send me the music that she would listen to books she would read. You know, we would talk about a lot of things. We did a lot of background work for Shideh. DF: And you were able to find plenty of VHS copies of Jane Fonda’s Workout? NR: (laughs) I did! They’re all on YouTube. DF: I felt like that was such a great added element to her environment. NR: I loved that. It’s so funny. It was such a big deal though back in the day in Iran. They loved Jane Fonda, even you weren’t allowed to watch it. DF: Which is interesting, because it’s a funny thing, moreso for America viewers I assume, but you’re character really holds on to and relies on as an outlet. The authorities in her life won’t let her be a self-made woman, so at home is the one place where she can. NR: Exactly. That’s why she also closes the curtains when she’s exercising, so nobody from the outside can see what she’s doing. DF: I’m sure you guys discussed this, but it’s a hard thing to imagine the impact this environment and Shideh’s behavior is effecting her daughter and how to help her figure out how to become her own woman eventually, since she sees her mom as an example, but at the same time your character knows that her daughter’s options will be limited. NR: Yeah. I never thought about that until now, to be honest with you. That’s a good point. Me as Shideh, I was so busy dealing with the daily things of life, that I don’t think that I ever thought about that before. DF: Maybe I did because I’m a parent of a 9-year-old daughter and my wife and myself are her examples. So, I couldn’t help but to try and look at what is transpiring from the girl’s perspective as well. In this film, all your daughter has is you as an example of what a woman is. DF: This premiered at Sundance this year. Were you in the audience while it was screened? If so, what was that experience like? NR: I was. It was very quite at times. The audience jumped during certain scenes. It was very special because everybody loved that movies so much. DF: Were you surprised by that? NR: I wasn’t surprised. No. Because I liked the movie too. It’s just such a beautiful experience. But, no – you’re right thought. Sometimes these movies polarize – is that how you say it? NR: Like, some people like it and some people don’t. But with this one, I didn’t hear one bad response. Everyone was just so amazed by it. It was such a beautiful experience. It was a really really great experience. DF: Right. That’s the feeling I had when I watched it as well. The theater I was at was very silent, but then there’s even laughter during certain parts of the film that you wouldn’t expect laughter. But it was obvious the audience was just absorbing it all. DF: You’ve done that before? NR: Yeah, I’ve done that with other movies. That’s really fun, when you see that, because it’s the audience and not critics or cinéastes. They’re just people out there, who are interested in watching a movie and how they respond to it. That’s very special. I just hide and I look from the back. I’ve done it twice or so. DF: And no one ever notices you? DF: Now, Sundance is where Netflix picked it up. Was that mind-blowing to you? NR: Oh, it was amazing. Even before it premiered. DF: Had Netflix already seen it before it went to Sundance? NR: Yeah, they had already seen it and then it was announced at Sundance, I think on the day it premiered there. DF: That is so cool. Because immediately after seeing the film, I was wondering how people will be able to see it. Then I saw that they’ll be able to watch it on Netflix and I thought “how perfect”. So, I know the actual release of the film is happening later this year. Were you given an approximate time? NR: I don’t have an approximate time, but it will have a North American theatrical release as well for a few weeks as well. Then after that, it will be streaming on Netflix. DF: Do you know if the theatrical release will be day and date with VOD? NR: It’s gonna be first the theatrical release and streaming on Netflix. DF: I know you’re a fan of movies, so I have to ask – what are you watching lately? Are there certain movies that you’re talking to other people about that you really enjoyed? NR: Oh yeah. There are so many. I mean, I watch a lot of movies. That’s my favorite thing to do, really. Let me see, what are the latest ones? There’s so many great movies out there. DF: You know, what surprises me, is that not a lot of people think that. They go to a multiplex and all they’re gonna see are big-budget blockbusters, but…. NR: I also watch those! DF: So do I, but the misconception is that that’s all that’s out there. I like it all. But, the independent and foreign films are the ones that really resonate more, for me. Which, in turn, motivate me to promote them. The blockbusters will always have an audience. So, I was just curious to see if there were some recent movies that stood out to you. NR: Hold on, gimme a minute….I did watch “The Suffragettes” and I did like that a lot, because of its political themes. Carey Mulligan does an amazing job in it. The actresses are amazing in it. There’s so many great women in this movie. DF: Well yeah, there’s Meryl Streep…. NR: Meryl Streep, I mean – she’s the bomb! (both laugh) Right? Of acting? She’s the Goddess of Acting. Her part is not that huge, but there are others and they’re just so great. It’s female-driven. It’s about women and their votes and how much they had to fight to be able to vote. To be equal. It’s been a journey. So, that’s very interesting from a political view. I really enjoyed that one. Oh, I loved “Spotlight”. I think that was amazing. DF: I thought it was great too. Were you surprised that movie received Best Picture? NR: No. I think it deserved it. DF: I thought it had tight storytelling and it was really well-done with great performances. I’m glad that it won, since it’s subject is still very timely. It’s not a big epic movie, but it’s, in a way, more important. NR: Yes. So, these are the kind of movies that I like a lot. DF: Well, I really want to thank you for our time today. It was really cool to talk to you. NR: Thank you! It was cool to talk to you. 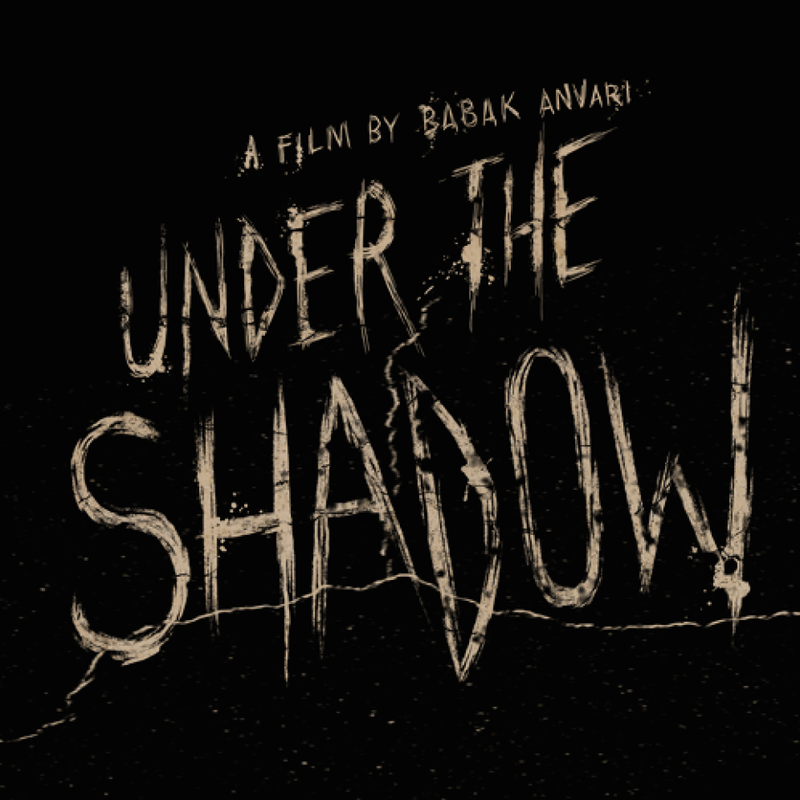 DF: I’m definitely going to be telling others about “Under the Shadow” and looking out for what’s next with your career and Babak’s next work as well. NR: Thank you! And I hope you find your way to Berlin one day and taste the falafels there. DF: I’m gonna get those falafels. NR: You should! They’re cheap too. I dunno, 3 euros or something. NR: Yeah, it is. For sure! DF: Well, thanks again, Narges. Have a great day. “Under the Shadow” opens in select theaters on October 7th in North America and will be streaming on Netlix shortly thereafter.